Freshly constructed, Europe’s tallest building looks like a giant alien mothership has landed. Makes me think of Doctor Who. This is beautiful, a great sceneries to visit for. Doesnt really fit the London skyline, “over the top” comes to mind. There’s been a lot of criticism of ‘The Shard’ but worth remembering that it replaced two rather grim office towers that no-one loved with a world-class building. But yes I would rather central London wasn’t being being randomly peppered with towers, however striking individually. And there’s much worse being built just across the river, and more to come. It literally does. I just watched the movie Sunshine last night.. and this definitely looks like some piece to the ship. Wow, that is quite the contrast between old and new buildings! That’s how I felt when Chicago almost build a really tall, narrow spiral building. Thank goodness it didn’t go through! Great pic! Pity the building looks like a shrunken version of the Australian Recording Industry Association (ARIA) music award trophy. Thanks for the London Bridge information there. It’s interesting that they built it in such an historic area (half the street names are from Dicken’s novels, for example) as opposed to near Canary Wharf. I really like the unique architecture of this building! renzo piano designs for future not present. like the dr. who reference. I completely agree that this building is striking and new, but I don’t get how it incorporates the traditional and old. Help? I’m not sure it’s designed to incorporate the old and traditional – it’s just very shiny and new! So out of place in the London horizon. Then again, that’s what they said about the Eiffel tower. It will probably be epic. All I see is alien. 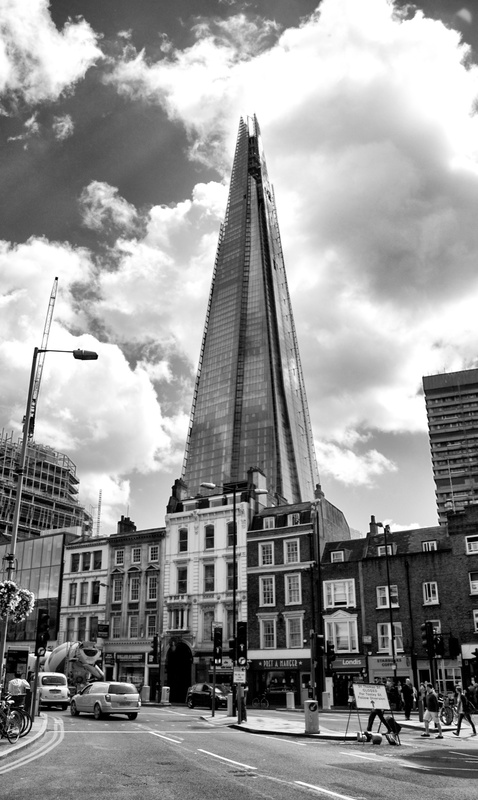 The Shard, the tallest building in the UK and, indeed, Europe, stands at 309.6 metres (1,016 ft). Wow, that is crazy! It looks neat behind all of the old building fronts. Out of place isn’t it? That looks like something the Yanks would do. I think this is a fantastic new addition to the London Skyline…along with several other recent new additions it finally gives London a sense of moving into the 21st century. While I fully agree on saving some of the beautiful historic buildings, there are a lot of eyesores too that can (should) be replaced, as the Shard has done – the previous structures at that site were awful! That’s a fantastic shot! It’s pretty cool looking, but I’m torn on how I feel about it standing out so much in the London skyline… Thanks for sharing and congrats on being freshly pressed! This is quite the juxtaposition. I love that you took the photo in b&w. Does it fit with the architecture? No. But is it better than some other buildings already in London or would be? Yes. Doesn’t seem very tall. Maybe I am just used to San Francisco. Very nice picture though! It’s 17m shorter than the Transamerica building so… a little smaller! Great photo! I for one love this building. I’m looking forward to going up to the viewing gallery next time I’m in London. Any idea if it’s free to enter? I don’t know if it’s free to enter, but they do have a tour to the top which I think is about £25 – pretty pricey really. The shard references the traditional church spire or ship’s mast, both icons of London’s past skyline along the river. What could be more apropos for our times than supersizing the metaphor and incorporating a shopping mall and a few apartments for the 1%? The only reason such projects get approved is with the name of a celebrity architect behind it. For better or worse, the culture’s adoration of starchitects yields buildings like the Shard, the Centre Pompidou, or Gehry’s Bilbao. Personally I feel there’s a lot to like about these playful and/or imposing structures. Having a consortium of Qatari billionaires and a crazy businessman certainly seems to help as well. Thanks for the architectural insight. Imposing is definitely a good description. What a fab picture, personally I think it looks great. Just looks odd to me. The only thing going for the building is it has that,” I look different than the rest” sort of impression. However, in a few year’s time, from the looks of the construction on the left side of this photo, it will not be so unique. Despite my critique of the building, I do think this is a lovely photo and will be an interesting, historical image. Nice job. I forgot to watch this. The general feedback seems to be that it was a bit of a let down. What did you think? I agree. I was a bit disappointed because the expectations had be raised by all the anticipation. However, the show was great. I think it was a bit repetitive and it lasted for too long. Where I was standing, many people were booing and leaving saying it was horrendous- I think that was definitely an overreaction. Were they expecting the aliens to land on the top and sing like Michael Jackson? ahah! All I can say is I am happy I was there. Sometimes people seem to enjoy the act of complaining more than the thing they are complaining about. I’ll make sure to go the next time, when the alien starts singing! Great photo, and congrats on being freshly pressed. Great work, the photo and the buiding! I loves it. Althought admittedly having stood at it’s foot after a few wines, it has made me want to throw up, but there was a crane loitering precariously on it’s summit. And I do get vertigo. And I was a bit drunk. Standing underneath it is a strange experience – you feel like you’re the one stood at a funny angle! I am in two minds about the Shard. I think it is great to have something new and exciting (although I don’t think the design itself is very exciting) in London but it is out of place where it currently is. I have to say though this is the first picture of it where I thought that it looked good. I know its design is controversial, but IMO London has always been a city of sharp contrasts and eclectic styles. The modern regularly appears alongside the old. There’s iconic architecture spanning centuries of aesthetic development and tastes; over time, it all becomes part of the vernacular. I love the Shard; it’s a new icon, with all the controversy, opinion-splitting and drama such a new development SHOULD entail. It certainly seems to have succeeded in splitting opinion, which is far better than people’s reaction just being… meh. That´s such a great picture, and a funny comment too! I hear that the inauguration ceremony was a total flop. Amazing pic. Shame about the name – ‘Shard’ is awful.. I like it when old buildings are mixed with brand new shiny ones! Cities that mix lots of architectural styles are really interesting to explore. The Shard might not be to everyone’s taste but at least it’s bold. I’d love to be at the top towering over London! Thanks. So far, being Freshly Pressed has been a much stranger experience! Stranger than the building itself. so true that it looks from another planet..
que tal construcción,,, creo q parece un escalera al cielo,, mucho contraste con las cosas alrededor, good! Great shot…….given people’s comment of it looking out of place……the areas grimey and dirty its gonna look out of place give it a couple of years and it will be the glass won’t be as shiny….the height….until other scrapers are built around it – it is gonna look out of place up close, but from the distance it will fit into the skyline of the city and canary wharf……unlike some of the proposals floating around for the Square Mile itself. Nothing exceptional about the atchitecture, this world did not need another Prisim/Pyramid. Definately not iconic, just another glass cladded structure. Freemasons and all sorts of conspiracy theories come to mind. I bet it has checkered flooring inside somewhere. London can pull off the mixture of old and new. Thanks for sharing. Loved the photo. Very sci-fi esque in how it is juxstaposed against the shabby buildings below. A great shot! Wow, great shot! Thanks! Looking forward to the next post! Nice black and white photo effect. The building looks outstanding from the retail store below. All I can see is a stork’s beak…whilst lay on its back of course…an alien sleeping stork maybe. I’m not a great fan… plus I think it looks like the top needs to be finished off! We just wish it was taller than the Eiffel Tower. I’d never even heard of the Shard until now, let alone seen it–that is amazing! Reblogged this on GeekerMind – Technology & Business in Action. Ugly as hell, a constant in modern architecture, no matter what country or designer, who seem not to be worried at all about the surroundings, cannot understand it, really! Great shot ~ great description! Beautiful monstrosity. Hope to see the sights when we come down for the Olympics! I watched the laser show unveiling thing online and it was horribly disappointing. Looked like 1980 with a soundtrack played by children. Nice juxtaposition. I love to stand directly under the Shard and look up to the top…incredible. Was wondering what it looked like! I wonder if people would have been ok with it if they would have called it “The Mast”. Personally, I think it looks pretty cool. Frankly, it doesn’t look finished. But I guess it’s the Qatari government’s issue, not mine! The skyline used to be dominated by St Paul’s Cathedral, a building that survived the Blitz. Now St Paul’s is dwarfed by this oil-funded monstrosity. Tallest building in Europe makes England (or rather those who funded the Shard) look very insecure. The first photo I have seen of it complete. . . Looks so out of place ! Great picture, but am I the only one who is completely underwhelmed by this building and cannot understand all the hype and praise for it? From what I understand, much of the top section is completely unusable as office or living space and has therefore been left exposed to the elements. I would guess that the intention is to use these areas as high-rise garden spaces for office workers to chill out in, with chill being the operative word – particularly during a cold and wet London winter – or even our current wet summer. Ok, so usable space isn’t really the main goal when creating a landmark building, but in the race to create Europe’s tallest building, this for me, just looks like a modern interpretation of a church spire. It shows none of the vision that brought us the Gherkin or City Hall buildings, and certainly doesn’t compete on a the world stage of architecture.